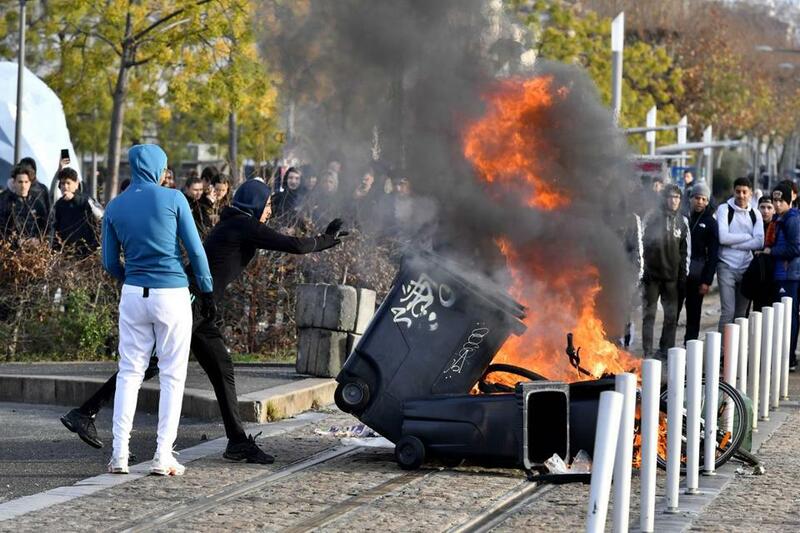 High school students in Bordeaux set a barricade on fire during protests against government education reforms. Macron decided Wednesday to ‘‘get rid’’ of the tax planned for next year, an official in the president’s office said. Prime Minister Edouard Philippe told lawmakers the tax is no longer included in the 2019 budget. The ‘‘yellow vest’’ protests began Nov. 17 over the government’s plan to raise taxes on diesel and gasoline, but by the time Macron bowed to three weeks of violence and abandoned the new fuel tax, protesters were demanding much more. Many workers in France are angry about the low wages, high taxes, and high unemployment that have left many people struggling financially. On Tuesday, the government agreed to suspend the fuel tax rise for six months. But instead of appeasing the protesters, it spurred other groups to join in, hoping for concessions of their own. The protests took on an even bigger dimension Wednesday, with trade unions and farmers vowing to join the fray. ‘‘I have no problem with admitting that on such or such question we could have done differently, that if there is such a level of anger . . . it’s because we still have a lot of things to improve,’’ the prime minister told legislators. Philippe said ‘‘the tax is now abandoned’’ in the 2019 budget, and the government is ‘‘ready for dialogue.’’ The budget can be renegotiated through the year, but given the scale of the recent protests, Macron is unlikely to revive the added fuel tax idea anytime soon. ‘‘It’s on the right path, but in my opinion it will not fundamentally change the movement,’’ she said. Three weeks of protests have caused four deaths, injured hundreds, and littered central Paris with burned cars and shattered windows. The sweep of the protests and their wide support by citizens of all political stripes has shocked Macron’s government. In the last few days, Paris saw the worst anti-government riot since 1968. French students set fires outside high schools to protest a new university application system, small-business owners blocked roads to protest high taxes, and retirees marched to protest the president’s perceived elitism. Macron’s popularity has slumped to a new low since the demonstrations began. The former investment banker, who has pushed pro-business economic reforms to make France more competitive globally, is accused of being the ‘‘president of the rich’’ and of being estranged from the working classes. The FNSEA farmers union said it would fight to help French farmers earn a better income but would not officially be joining forces with the yellow vests — protesters wearing the high-visibility vests that motorists are required to keep in their cars. ‘‘We need taxes, but they are not properly redistributed,’’ protester Thomas Tricottet told BFM television. The high school students’ FIDL union called for ‘‘massive’’ protests Thursday and urged France’s education minister to step down.